As seen in Q2 V8 2016 issue of the EMA Foundation for Paper-Based Communications newsletter, On Paper. Click here for a PDF of the article. I have had the privilege of being a member of this industry for over 66 years. I started working at Tension on Saturdays at the age of 16 in the Composing Room. I was too young to be around moving machinery. At that time, we ran rotary plungers and Winkler & Dunnebier rotary fold­ing machines which folded an envelope blank only. There was no window section or printing units. A rotary plunger ran at a speed of 6,000 to 7,000 envelopes per hour, twice the speed of the old plunger machine, which ran only one size. By changing certain parts, the rotary plunger could run several sizes. The W&D folding machine could make any size envelope between the minimum and maximum specifications, and ran at the amazing speed of 200 per minute, 12,000 per hour. In those early days, a window enve­lope was made by placing 15-20 die cut blanks on a wooden cutting block of a punch press. The foot-activated head with a die locked into it came down and cut or paneled the window in the blanks, which were placed against adjustable pins on the cutting block. The paneled blanks were then taken to a patch machine where a glassine patch was applied. Glassine, as you may know, is super calendared paper that becomes transparent. The patched blanks were then taken to the W&D folding machine and placed in the feed. Window envelopes ran considerably slower than regular envelopes because of the hump in the stack of envelopes in the feed caused by the glassine patches. My dad, E.B. Berkowitz, concluded that the patching process should take place in the folding machine rather than in a sep­arate operation. E.B. and Kitty, my moth­er, took an ocean liner to Europe. Their destination was Neuwied, Germany, home of Winkler & Dunnebier. Richard Winkler had a large office with a high ceiling. Visualize, if you will, two engineers on ladders covering one wall with paper, and with large crayons drawing the front sec­tion of a folding machine with changes as instructed by E.B. Then he had them draw into the changed front section the glassine unwind section, the knife section to cut off the patch, a vacuum cylinder to pick up the patch and release it onto the gum, which the gumming section had applied around the paneled window. The use of vacuum in itself was revolutionary. The first Type 29 W&D window enve­lope folding machine was built soon there­after, and shipped to Tension/Kansas City for testing for several months under actual production conditions. W&D built the first batch of Type 29s incorporating the changes made under actual production conditions. The Type29 was an instant best seller. The next development was the Type 18 press. Once again, E.B. was instrumental in the development. 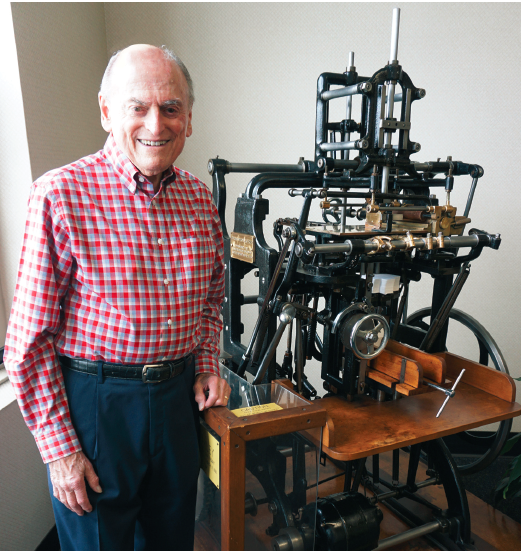 He said to W&D that the Harris P-2 press, the predominant press in our industry at that time, was too slow, 8,000-to-9,000 per hour using grippers to hold the blank to the cylinders, and feeding one side and delivering on the other, requiring two aisles. E.B. asked W&D to develop an aniline ink press using vacuum to hold the blank on the cylinders, would feed and deliver on the same side, and would run at 18,000 per hour or faster. W&D was up to the task. A one-color Type 19 press was first devel­oped, then an improved version, Type 18 one color, and finally an 18-G, two colors outside and one color inside. Subsequently, a printing section was added to the Type 29, as was the four-piece knife cutting section that was developed by W&D in the late 1930s and was first incorporated into the Type 30 and then the Type 31 machines that paneled and patched a die cut blank, which was then placed in the feed of a folding machine. Back then the Type 31 was quite expensive and most U.S. envelope manufacturers used a lower cost F. L. Smithe patch ma­chine, as described earlier. If one looks at contemporary fold­ing machines running well over 1,000 per minute, the window section and the printing section are much the same as E.B. helped W&D create years ago. The gearing and other parts of the machine have been improved, but the basic design remains the same. Please allow me to go back one more generation. My grandfather, William J Berkowitz, founded our family business in 1886. We celebrated our 130th anniver­sary on March 17, 2016, St. Patrick’s Day. William J was one of the three founders of our envelope association. In 1914, at the beginning of the First World War, the con­tinuing existence of the envelope industry was in doubt. The U.S. Printing Office, Washington, D.C. was manufacturing en­velopes at a very low cost, selling them to the U.S. Postal Department, and envelopes were available in every Post Office in the country. The reason for the low price was that the U.S. Printing Office, as a govern­ment department, could buy paper during the war at a much lower price than other envelope manufacturers. In 1915, as President of the Associa­tion, at his own expense, William J went by train to D.C. to talk to the heads of the U. S. Printing Office and the U.S. Postal Department. His position was that if the Postal Department sold envelopes at a low price, but did not promote the importance of mail, the Postal Department would not grow. A part of his presentation was that advertising through the mail could create significant volume for the Postal Depart­ment. He pointed out that printers, enve­lope manufacturers, and others could be instrumental in selling the idea of adver­tisers using the mail. He was persuasive. The head of the department agreed, and they stopped selling envelopes. At that time, my grandfather was given credit for helping to save our industry and for help­ing to create the direct mail industry. Our association is primarily made up of family owned businesses. Each of us has proud traditions. In most cases, a member of the family is involved at the higher levels of the organization. This in­dustry will survive because we want those proud traditions to live on. Because we are able to marry our products with up-to-date technology, the future is bright. In closing, I am indebted to Fred Doder­er for contributing meaningful historical information about machine development at W&D.